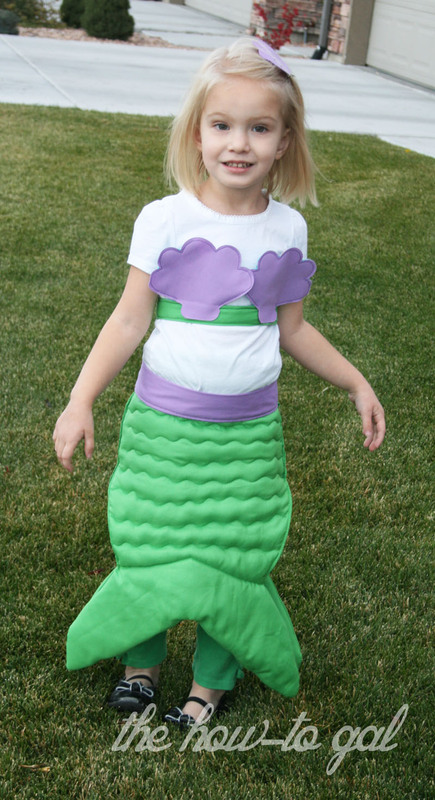 This year my little girl decided she wanted to be a mermaid for Halloween. I'm not quite sure how we finally settled on mermaid - it was something different everyday- cat, witch, whale, rock star, mermaid. 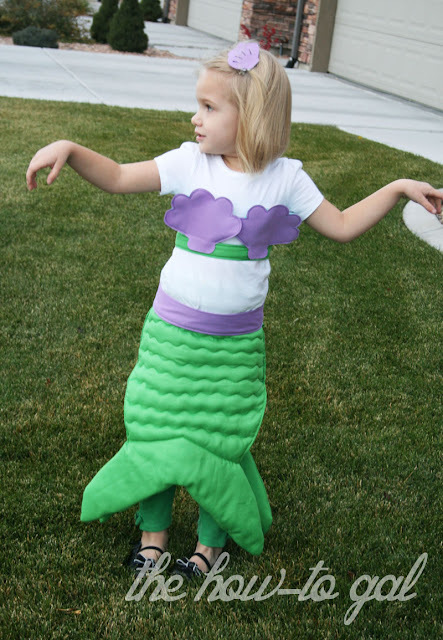 But, boy am I glad she decided on mermaid because I had a great idea on how to make the fins. I wanted it to be comfortable for her to walk in it. There are a ton of mermaid skirt costumes out there, but I didn't want my three-year-old to have to walk around in a maxi dress all night long. The costume had to be something she could put on herself when she wanted to use it for future dress-up play. I didn't want to spend more than $5. 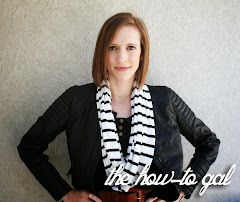 For the fabric, I headed to my local thrift store to see if I could score some green sheets. 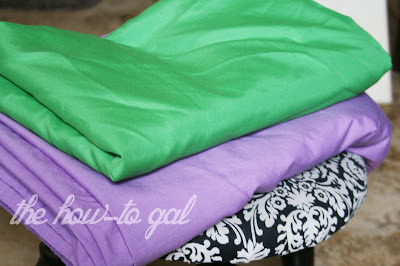 Lucky me, they had the perfect shade of green and a purple one I thought would work great for the sea shell bra. Total spent: $4. 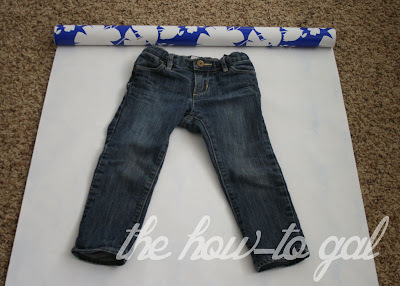 Step One: I rolled out some wrapping paper and made a pattern for the tail with a pair of her pants as a guide. A little below the knee, I made the tail's fin. 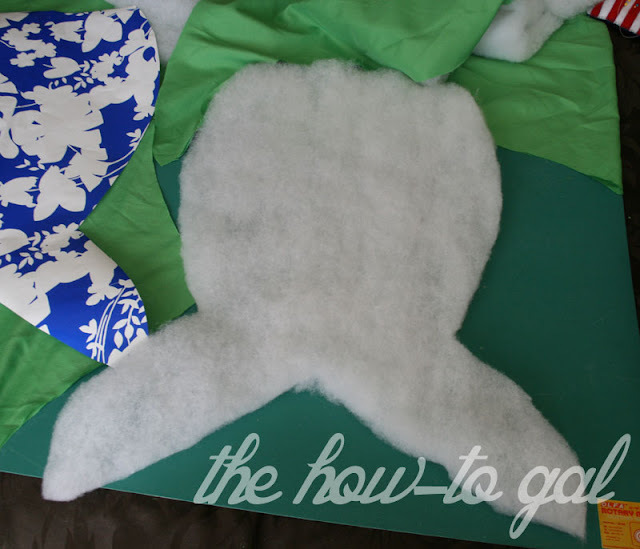 Step Two: I cut out four tail pattern pieces out of the green fabric. Step Three: I cut two pieces of batting (had on hand) in the shape of my fin. Step Four: I placed two fin pieces right sides together with the batting on top and sewed it up, leaving a small opening on the side to turn right side out. 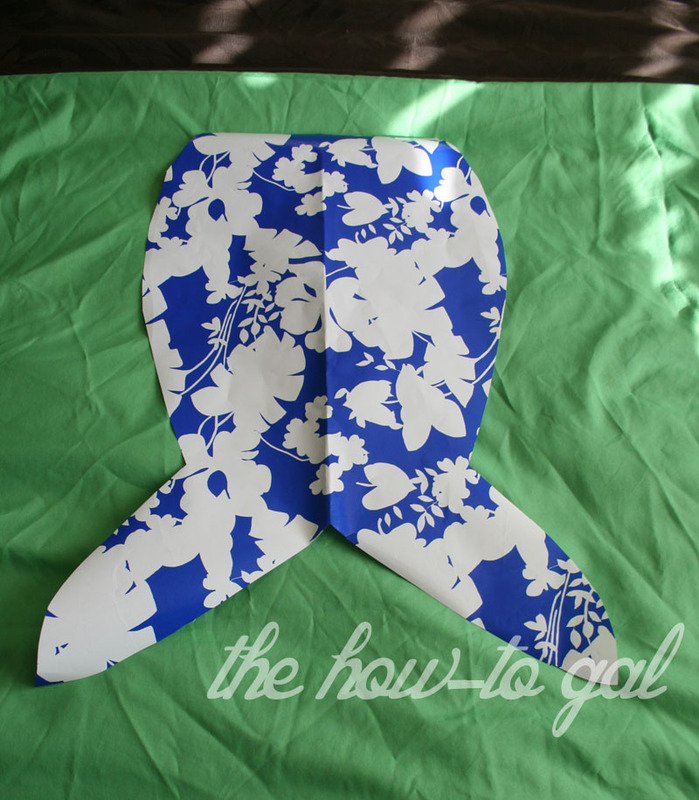 Repeat for your second fin. Step Five: I top stitched around the edges to sew up the hole and give it a finished edge. Step Six: Quilt your fin. I found a curvy stitch on my machine, set it to the largest size it would go and then stitched straight across my fin. 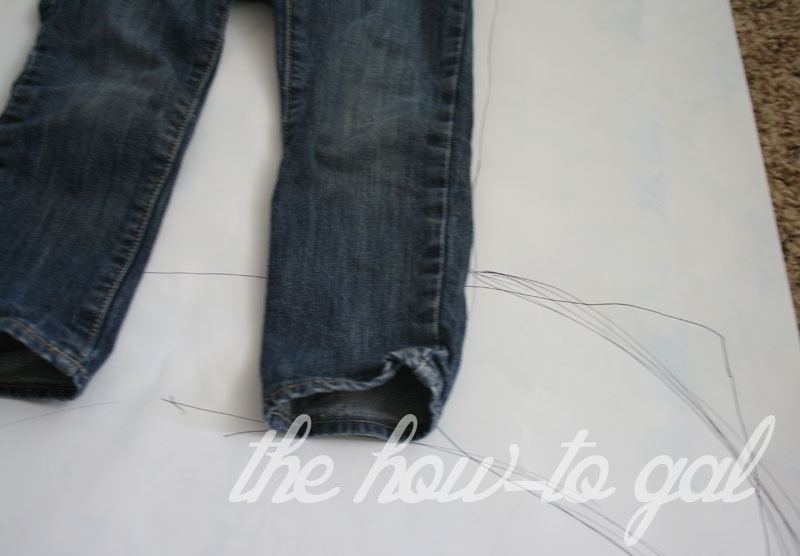 Step Seven: I simply sewed an elastic band that fit my daughter's waist to both fin pieces. I didn't make a casing or bother to cover the elastic at all. It is a costume after all! Step Eight: I sewed the sides up from about her bum up to the waist band to give the appearance of a fin, but still allowing her to walk. Step Nine: I made the sea shell bra by cutting out two seashell shapes (with my Cricut) and sewing them over the cups of an old sports bra (fit to her size). 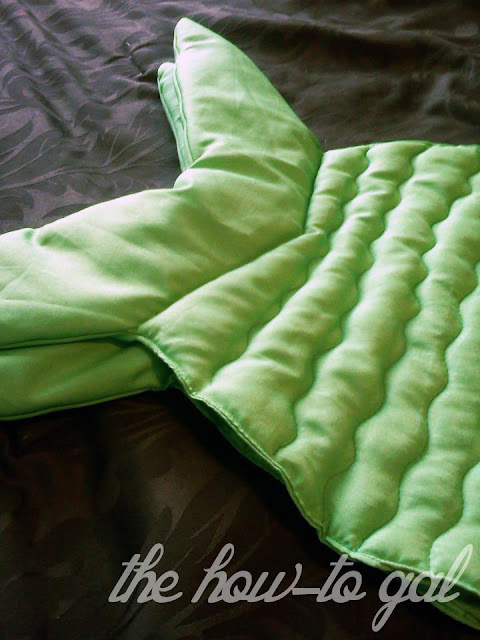 I also covered the bra's elastic bottom with matching green fabric. Step Ten: For finishing touches, I made a little purple belt and a seashell hair clip!